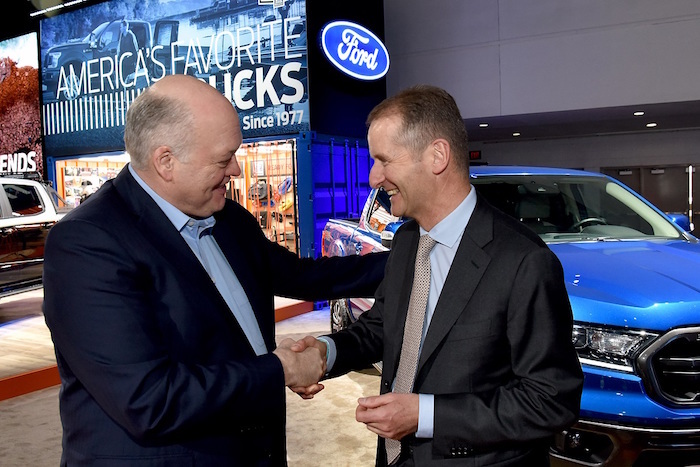 The Ford family has no plans on giving up the company that has been under its control for 115 years – despite the automaker entering a strategic partnership with German automaker Volkswagen recently. Speaking at the recent North American International Auto Show in Detroit, Bill Ford told Crain’s Detroit Business that a co-ownership deal between Ford and VW “never came up” and isn’t likely to happen in the future, no matter how cozy the two automakers get with each other. “I suppose you never say never, but I sure don’t ever see a day where the Ford family gives its voting control of Ford Motor Company,” Ford said. Descendants of Henry Ford that sit on the automaker’s board, which includes Bill Ford and Edsel Ford, have 40 percent of voter power among the company’s shareholder’s no matter how much stock they own. The new Ford and VW partnership will see the automakers join forces on midsize trucks and commercial vans, along with a city van. Ford is believed to be handling development of the midsize truck and commercial van, while VW will focus on the city van. The two automakers are also working together on autonomous and electric vehicles. Crain’s Detroit reports that Bill Ford called the electric and autonomous vehicle partnership “really complicated,” but it’s not yet clear if that means talks are breaking down, or if they are simply having trouble hashing out the details. Ford and VW group have also partnered on V2X technology, which allows vehicles to communicate with the infrastructure grid, other vehicles and pedestrians’ mobile devices to help make streets safer and less congested. At the time, Ford said it was inviting “other automakers, governments and tech companies to join the significant momentum building for a C-V2X ecosystem,” as a large-scale rollout is essential the technology’ usefulness. If Ford and VW establish the first V2V and V2X communications on their future products, the others become followers. We need this technology for the best autonomy future possible!